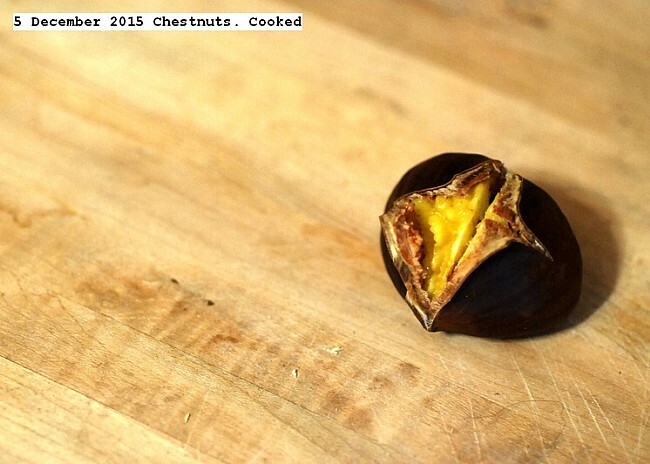 Cooking chestnuts using the microwave.The nut is scored with a cross using a knife and hammer. This is to release air when cooking, otherwise the nut explodes. The nut is cooked for 1.11 minutes. The shell and lining is then finger removed by pulling the protruding corners of the cross.The nuts are perfect and were purchased from Costco. This entry was posted in Uncategorized and tagged Chestnuts, Roasting Chestnuts. Bookmark the permalink.